Horatio Sanz, comedian and cast member of SNL from 1998 to 2006 has shed over 100 pounds, and now he is actually pretty hot. Weird. 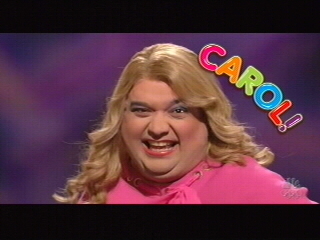 I always loved Horatio on Saturday Night Live, the 39 year old played one of my favorite characters from that era, Carol. He always looked like he was having so much fun playing her, although he usually looked like he was having so much fun on SNL in general. He and Jimmy Fallon (what happened to his career by the way?) were always laughing at inappropriate moments. Watch the Intro here… it is worth the 15 seconds. Good for him! Even though I will never see that obese dream Carol again, I think it was worth it for the health bonus and new lease on life that I am sure Sanz has. In honor of her untimely demise, check out this clip from The Key Party. He does look quite a bit better now, I admit. Almost like Kevin Smith with the beard (I’m a fan, so this is a GOOD thing). I miss seeing him on SNL, I hardly ever watch anymore since everyone I like already left.